Thursday April 12th 2018, Benefit the Moria 35, Volkseten Vegazulu, 7pm. Solidarity actions are also welcome! Monday March 5th 2018, Benefit Dinner, Volkseten Vegazulu, 7pm. 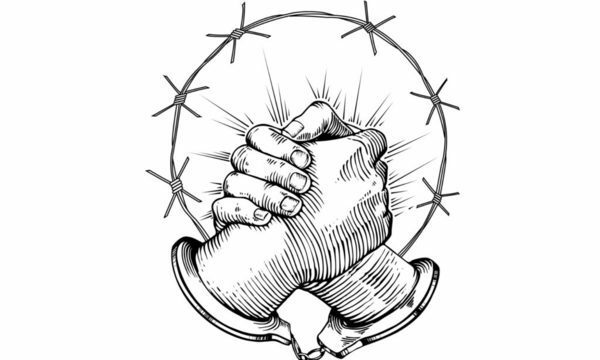 Today’s Voku in Joes Garage is dedicated to the “Pan-European meeting for practical solidarity” that is going to take place in Cologne on the of the 17th and 18th of March, around the day of the prisoner. Doors open at 7 pm. We will prepare a nice soup, vegan dishes and dessert, play canned music and distribute some information about the practical solidarity weekend in March. In 2017, one comrade from Barcelona was sentenced to seven and a half years of prison in Aachen. She is now in Willich prison. 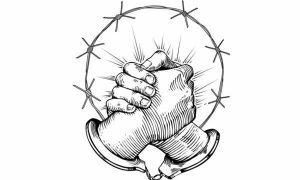 During our work of mutual solidarity that extended throughout Europe, we quite often realized that there is a common wish for better getting to know each other and to jointly express our solidarity with those affected by repression. This led to the idea to make use of the weekend around the day of the prisoner, on 18th of March 2018, for collective activities in Cologne and Willich. Thursday February 8th 2018, Mumia Abu-Jamal Benefit, Volkseten Vegazulu, 7pm. Thursday February 1st 2018, Benefit for Libertatia squat in Greece. Volkseten Vegazulu from 7pm. Music afterwards with Rebet Guitar (Charis Konstantinou). On 21 January 2018, the fascists attacked the squat Libertatia in the center of Thessaloniki, under the protection of the police after a demo that was called by the Christian fascist groups for the name of Macedonia. The day after, there was a demonstration in the city and 5 people got arrested. All around Greece, there was a call for demonstration against the state and the fascists. It’s not the first time that the police and the fascists work together against the anarchist movement, immigrants, free spaces and queer people. The collective of Libertatia is not giving up and they want to rebuild the social center. This attack is not gonna frighten anybody within the movement. Such an attack makes a stronger movement to fight against the state, the capital, the Christian churches and the fascists. REBET GUITAR – Rebetiko, the music crossroad between middle east and west from the early 1900’s. Songs about love, joy and sorrow. A musical sub-culture, a music of the lower classes. 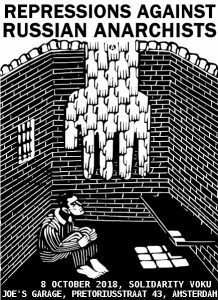 Monday 20th November 2017, Benefit for the political prisoners in Turkey, Volkseten Vegazulu, 7pm. IS RESISTANCE AGAINST FASCISM ! Dear friends and Comrades : the nowadays law in TURKEY obliging the prisoners to wear an uniform is one of the reactionary offensives of the fascist dictatorship that aims for standardizing the very whole people. It would be a mistake to consider it only as a plan against the prisoners because it is better a new attack of the fascism against the people and all the strengths of the democracy in Turkey and Kurdistan. As well in the society and in prison : the Turkish State rejects the existence of all Opposition to his fascist regime. That’s why the project of uniform for prisoners is not a dress problem but rather a new stage in the program of standardizing the country and of muzzling it. In Turkey, with the present Government of the AKP (1) the practices of the fascism reach their summit : we protest against the application of this iniquitous Law and we say : STOP ! ALL THIS PROJECT SHALL NOT PASS ! At the beginning of the 90’s, among his incessant attacks : the military fascist regime will still try to put this project in the agenda but the increasing extent of the Resistance dissuades him. All the attempts of attacks from the fascist regime in Turkey are a failure : they don’t succeed in their plan. 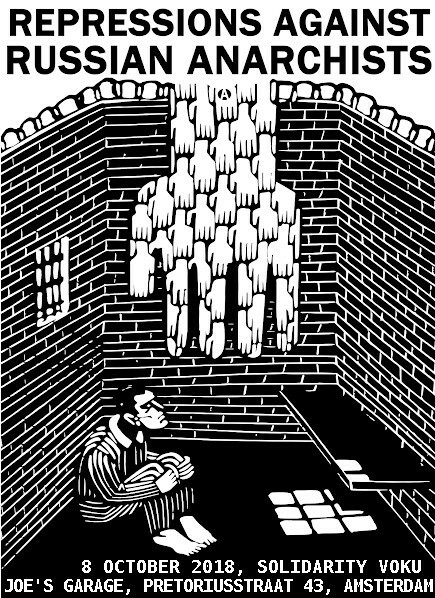 The political prisoners are the most Resistant part of the society and in capacity for sacrificing itself for Freedom. Yet, the fascist Turkish State fears all this would generates waves that spread within the people. That’s why, the prisoners become his first target and once again, he wants to mate them definitively and to succeed in imposing the port of the uniform for prisoners in the way to contain the whole society under narrow control. As by the past, the present Government of the AKP wants is own revenge against this permanent affront and he wants to weaken the revolutionaries and the Opposition by nazi practices such as political persecutions, massacres, systematic torture and uniform for prisoners like those in the Guantanamo’s Camp but the Resistance is going to be enormous ! Every time that the fascist Turkish State will try to shut up the sound of their voice, we will always shout with a stronger voice, we will be their voices. We have refused to wear the uniform for prisoners and we never will ! The oppression and the threats will not intimidate us, we will be victorious ! Long live for the Revolutionary solidarity! Long live for the International solidarity! (1) AKP. (Adalet ve Kalkınma Partisi-Party of Justice and Development). It’s one of the Turkish fascists partys. The AKP is in the government of the Turkish State, and since the last elections he cheated the votes against the victorious HDP (Democratic Party of the Peoples) which obtained an overwhelming majority against the AKP’s fascism regime. Monday 21st August 2017, Benefit for the political prisoners in Turkey, from 7pm. Music with the Resonant Rogues from 8:30pm till 10pm. Our Kurdish friends are back for their monthly benefit for the political prisoners in Turkey. After the food, on the stage, music with the Resonant Rogues from Asheville, North Carolina, duo accordion, banjo, guitar, vocals, suitcase, percussion. Two years ago, the Resonants Rogues played all the squats in Amsterdam. Their tour blog is all about what they experienced in Amsterdam and further.